After weeks of controversy, Israeli Prime Minister Benjamin Netanyahu is finally set to address a joint session of Congress Tuesday. In January, Boehner invited Netanyahu to address a joint session of Congress to talk about the Iran nuclear negotiations, which the prime minister vigorously opposes. Boehner issued the invitation without consulting the White House, which some argue is a violation of protocol. The White House has said President Obama will not meet with Netanyahu while he is here, citing a precedent that U.S. officials have a longstanding practice of not meeting with foreign leaders so close to their elections. Israel's elections take place on March 17. Netanyahu spoke to the largest pro-Israel lobby in the U.S., the American Israel Public Affairs Committee, at its conference Monday. While he declined to preview the content of his speech, he did delve into the reason. "As prime minister of Israel, I have a moral obligation to speak up in the face of these dangers while there's still time to avert them," he said. And he acknowledged the extensive hand-wringing over the address. 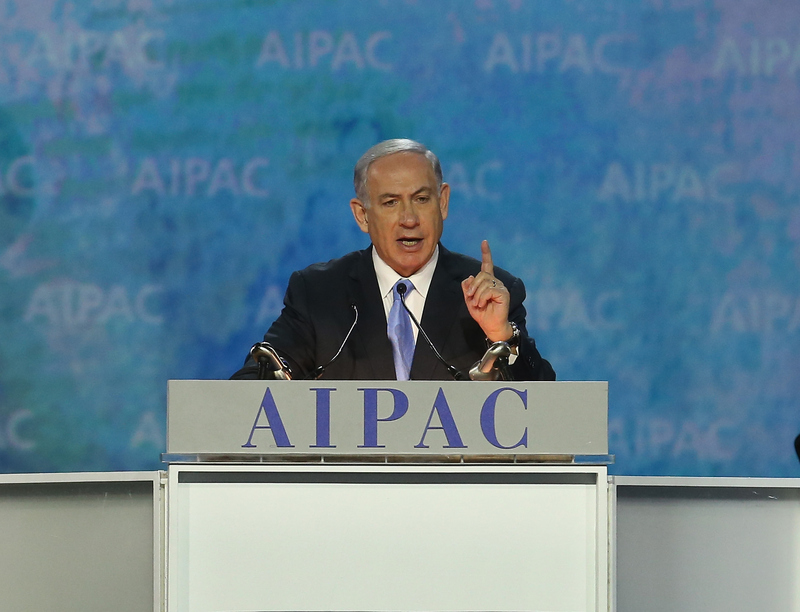 "Never has so much been written about a speech that hasn't been given," Netanyahu said. Over 30 members of the House of Representatives and at least six senators have said they will skip the speech Tuesday. The reasons they gave range from objecting to the timing of the speech so close to Israeli elections to the fact that the invitation was issued by only Boehner, and was not bipartisan. Vice President Biden will be in Guatemala on a foreign trip, giving him a convenient way to avoid making the decision of whether to attend or not. And Secretary of State John Kerry will be in Switzerland meeting with Iranian Foreign Minister Mohammad Javad Zarif for the ongoing nuclear talks. That's not to say there isn't plenty of interest in the speech. "The demand for seats in the House, the demand for tickets, I've never seen anything like it. Everybody wants to be there," Boehner said on CBS' "Face the Nation" Sunday. One of his aides said Boehner's office has received ten times more requests than the number of available seats in the gallery. Boehner has invited Holocaust survivor and Nobel Peace Prize winner Elie Weisel to be his guest. Boehner's office also said former Republican House Speaker Newt Gingrich will attend. Several Republicans who hope to be the next president will also be in attendance, including Sens. Ted Cruz of Texas, Rand Paul of Kentucky, Marco Rubio of Florida, Lindsey Graham of South Carolina, and Ohio Gov. John Kasich. Netanyahu's speech has laid bare some of the divisions in the American Jewish community and sparked a flurry of lobbying efforts by groups hoping to urge lawmakers' attendance. AIPAC, has said all members should attend, and Buzzfeed reported that former board members instructed AIPAC activists to contact the offices of Democratic Reps. Chris Van Hollen and Gerry Connolly to ensure they attend the speech. There has also been the war of full page New York Times ads: The Republican Jewish Coalition took out an ad featuring pictures of Iranian leaders alongside their words calling for Israel's destruction and warning, "Nuclear Iran is unthinkable. The time for debate is now, not after Iran gets nuclear weapons." The ad urges people to tune into Netanyahu's speech. On the other side of the aisle is J Street, a liberal pro-Israel advocacy group, whose own ad in the Times reads, "Prime Minister Netanyahu: Congress isn't a prop for your election campaign." It says that the Israeli and U.S. presidents, former Israeli ambassadors, elected U.S. officials and major American Jewish leaders said he should postpone the speech. The Zionist Organization of America his holding a rally in support of Netanyahu's address Tuesday morning, while Jewish Voice for Peace paired with groups like U.S. Campaign to End the Israeli Occupation and CodePink to launch a campaign urging members to skip the speech. William Kristol, founder of conservative magazine The Weekly Standard and chairman of the Emergency Committee for Israel penned a sarcastic letter to former Secretary of State Hillary Clinton asking whether she planned to attend the speech. In mid-February, Israeli news outlets began reporting some details of the ongoing nuclear talks with Iran as well as reports that Netanyahu was being kept in the dark about the status of negotiations. The Obama administration has denied reports of a deep freeze on communications, but it's clear that there are still concerns about leaks at the highest levels. "We are concerned by reports that suggest selected details of the ongoing negotiations will be discussed publicly in the coming days," Kerry told reporters while traveling in Switzerland Monday. "I want to say clearly, doing so would make it more difficult to reach the goal that Israel and others say they share in order to get a good deal. Israel's security is absolutely at the forefront of all our minds but rightly so is the security of all the other countries in the region, so is our security in the United States." What does Netanyahu's U.S. visit mean for an Iran nuclear deal? Speaking to reporters on the flight to Washington, a member of Netanyahu's entourage said the Israeli leader had details about the still-developing deal with Iran that he believed U.S. lawmakers needed, but did not yet have. But in his speech to AIPAC Monday, Netanyahu hinted that he might have acknowledged the limits of what he should say publicly to avoid further public damage to the U.S.-Israeli relationship. "I deeply appreciate all that President Obama has done for Israel, security cooperation, intelligence sharing, support at the U.N., and much more, some things that I, as prime minister of Israel, cannot even divulge to you because it remains in the realm of the confidences that are kept between an American president and an Israeli prime minister. I am deeply grateful for this support, and so should you be," he said. When Netanyahu addresses Congress on Tuesday, he'll be speaking to the U.S. lawmakers in the room, but his words will also be directed at Israeli voters, who will decide in just two weeks whether their prime minister deserves to be reelected. Thus far, the outcome of the March 17 vote is far from certain. When Netanyahu called for elections last December, he was heavily favored to win another term. But he's now running even with or slightly behind his main challenger, Israeli opposition leader Isaac Herzog, in most opinion polls. Because Israel has a parliamentary system, Netanyahu's Likud party could conceivably receive fewer votes than Herzog's Zionist Alliance while still managing to assemble a coalition to retain the prime minister's office. But at this point, all bets are off. This precarious electoral situation could explain why Netanyahu decided to deliver an address in the U.S. about his opposition to a deal over Iran's nuclear program just two weeks before his countrymen head to the polls. The sight of the Israeli prime minister rallying lawmakers from Israel's closest international ally to back a position supported by the vast majority of Israeli voters could be a big boon for Netanyahu's reelection campaign. It's a tactic he's employed before: the last time Netanyahu ran for reelection, he used clips from his May 2011 address to Congress to bolster his argument that, "when Netanyahu speaks the world listens." Of course, the last time Netanyahu spoke before Congress, his speech wasn't the political football that Tuesday's address has become. Some believe the division Netanyahu's speech has sown in Congress could ultimately harm his reelection bid, if Israeli voters conclude he's endangered his country's alliance with the U.S.
"The behavior over the last few days created the impression of a cynical political move," argued former Israeli ambassador to the U.S. Michael Oren, according to Ynet News. "It's advisable to cancel the speech to Congress so as not to cause a rift with the American government. Much responsibility and reasoned political behavior are needed to guard interests in the White House." President Obama has said he will not meet with Netanyahu during his U.S. visit because he wants to avoid the appearance of meddling in a foreign election. Netanyahu is hardly the first foreign leader to address a joint session of Congress. It became a standard part of foreign leaders' state visits to the U.S. after 1945, according to the House of Representatives Office of the Historian. But with this speech, Netanyahu will enter a rarified category: world leaders who have spoken to Congress three times. He will join former British Prime Minister Winston Churchill, who spoke to the House and Senate in 1941, 1943 and 1952. To honor the record, Boehner will present Netanyahu with a bust of Churchill on Tuesday. Netanyahu also addressed Congress in 1996 and 2011. His most recent speech in 2011 was also somewhat controversial as he pushed back on President Obama's proposal for Israeli-Palestinian peace talks. Watch Netanyahu's speech live on CBSN at 11 a.m. Tuesday. CBS News' Rebecca Kaplan, Jake Miller, Alicia Amling, John Nolen and Steven Portnoy contributed to this report.